A lot of credit is given to the wood you choose in guitar making. Certain combinations or "recipes" of woods are thought to effect all sorts of elements of the sound production of a musical instrument. Different species and different pieces of the same species, even if cut from the same tree, can all have very different acoustic qualities. I scour my super secret sources on a fairly regular basis for discarded and reclaimed wood, and have put together a pretty great collection old, well seasoned wood from trees most likely felled most likely long before I was born. Throughout this project I've been squirreling away some of the better looking/more sonorous pieces. I had been saving a particularly holey piece for an electric guitar top and after finding a nice old wide-grain piece of fir for the back I started to assemble all the parts. I decided to change things up with the inlays on this one and break the pieces instead of carefully cutting them out and it made for a really interesting effect. 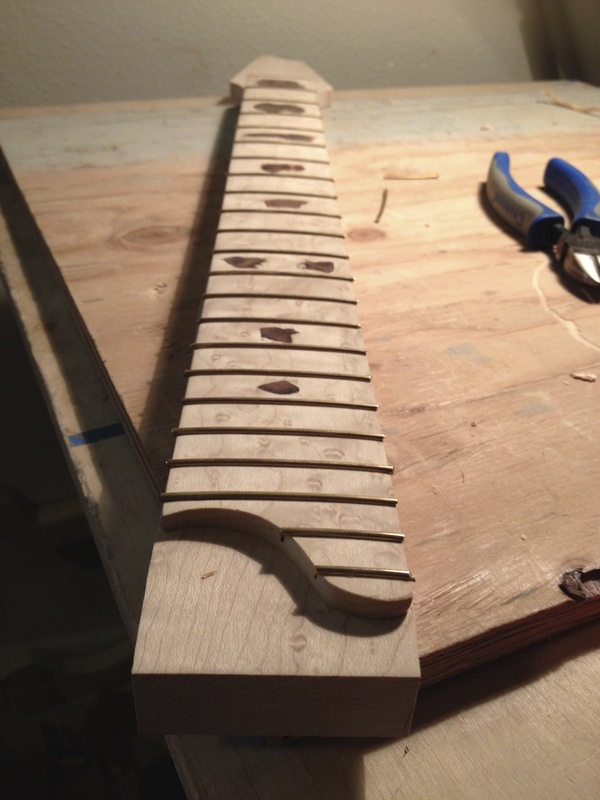 I had some nice birdseye maple left from a pervious guitar to make the neck. I really like birdeye maple, its one of my favorite looking woods and take polishes so well. I got these wood covered dominger pickups off ebay a couple years ago knowing I would build them into something at some point and this seemed like the perfect project to use them on. 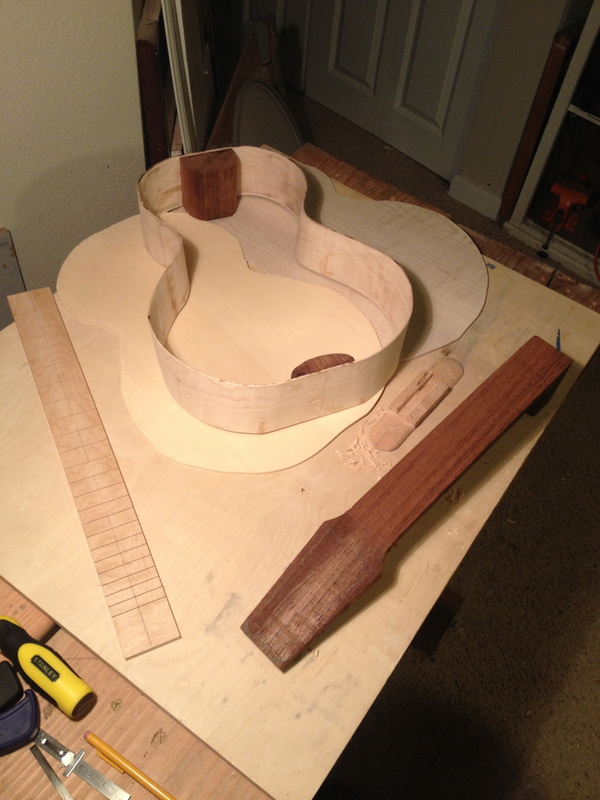 I routed most of the back out and except for the upper bouts and a center block for the pickups and bridge to mount to. To go with the re-use theme of this guitar found some Hagstrom tuners, a strange hardtail bridge, and these wonderful old wooden radio knobs all off ebay. 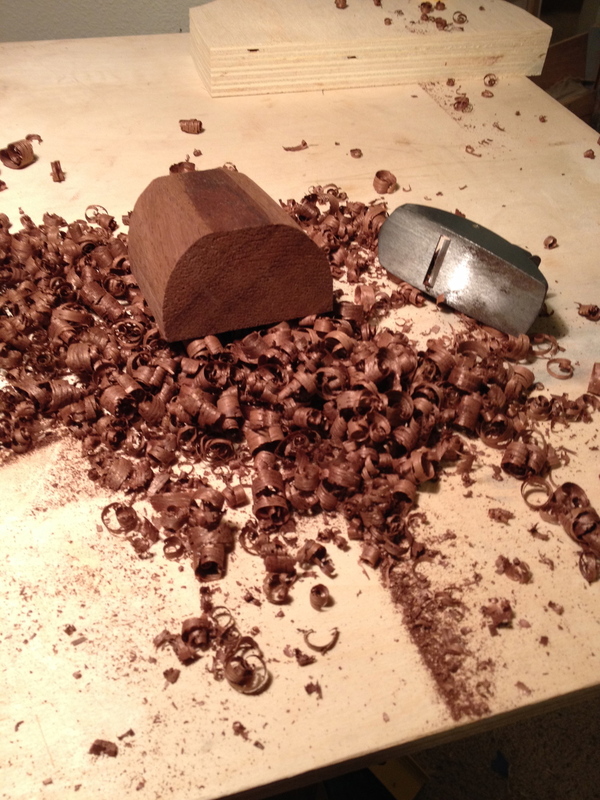 I also needed rings for the pickups to mount to, so I them out of cherry scraps from another project. This took some doing to get them to fit properly but i was really pleased with the way they came out. I've been using tru-oil gunstock finish for the last few instrument and really like how easy it is to apply and the wonderful results it gives you. I think it really made this guitar glow. Lastly I needed to make a panel to cover the large access in the back. I got several boards of this old, reclaimed, very tight grained, wavy pine that I've been setting aside to make acoustic tops out of. I decided to follow the style of the fingerboard inlays and break some more pieces into sort of poppy-like flower shapes. I made the stems from a new process I've been experimenting with using acrylic filler mixed with watercolor. Soon I'll make a video so whoever is interested can hear the guitar and see some more of its features. 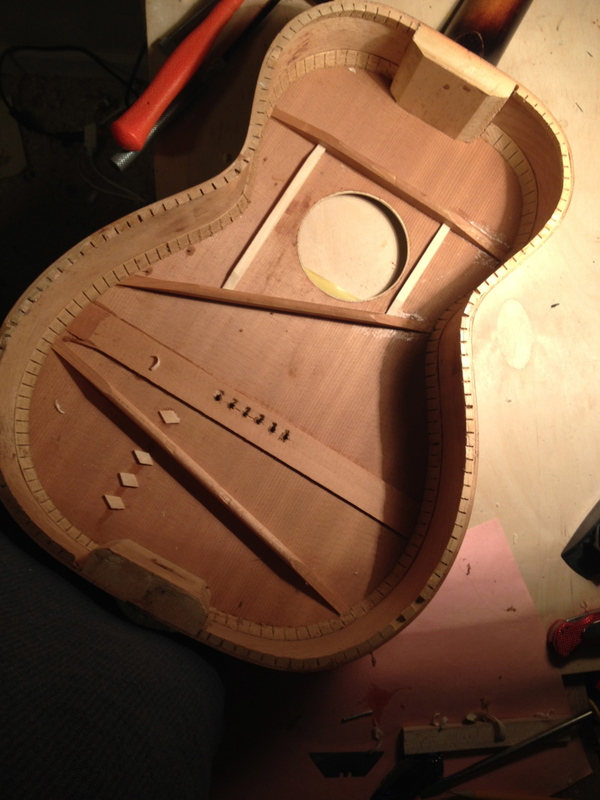 Here is a small gallery of the guitar in all of its finished and assembled glory. I'm always looking for projects that will challenge me and force me to learn new skills and hone old ones. Restoring old instruments teaches you a lot about building new ones. So when I saw an ad on craigslist for this old Maybell guitar I jumped at it. When I drove up to Tacoma to take a look at the guitar I was really taken with the store, it was full of all sorts of interesting and inspiring materials for all sorts of art making. 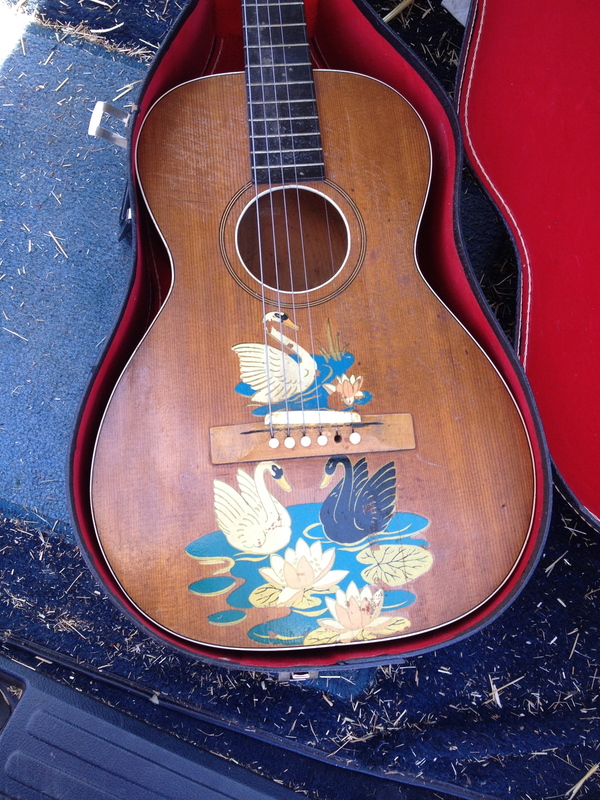 But when I saw the little wreck of a May Bell guitar with its unique swan decals I knew I had to get it and get it up and running again. It had significant problems. The maple bridge had been pretty badly chewed up and the strings had cut in almost to the saddle slot which at some time had been filled with a mysterious glue. the top was badly warped and the back had lost all of its braces and had begun to ripple itself off the guitar. I was able to remove the back pretty easily with a pallet knife and get a closer look at the problems. The three main braces on the top had all come loose in places and needed re-gluing. I also need to guesstimate the radius of the back. I could tell it originally had a curved profile but with none of the original braces I had no reference other than what was left of the curve in the back itself. So I carved 4 new braces and used my belt to protect the old finish of the back as I go-barred the braces in place. After shaping the braces the back started to ring impressively for and old piece of flat sawn birch, and so I started to focus on fixing the problems with the top. I cleated a crack, re-glued the popped braces and added two small braces on either side of the soundhole to help fix some of the distortion in the top and to further stabilize what is an arguably under-built guitar. 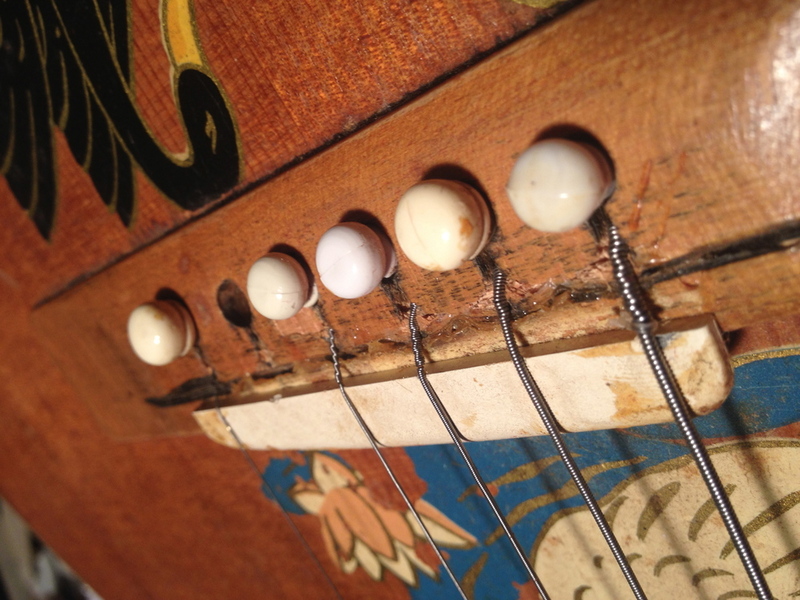 The bridge plate is a of spruce instead of maple or some such similar hardwood, and as a result it had almost worn through where the ball-ends of the strings sit. 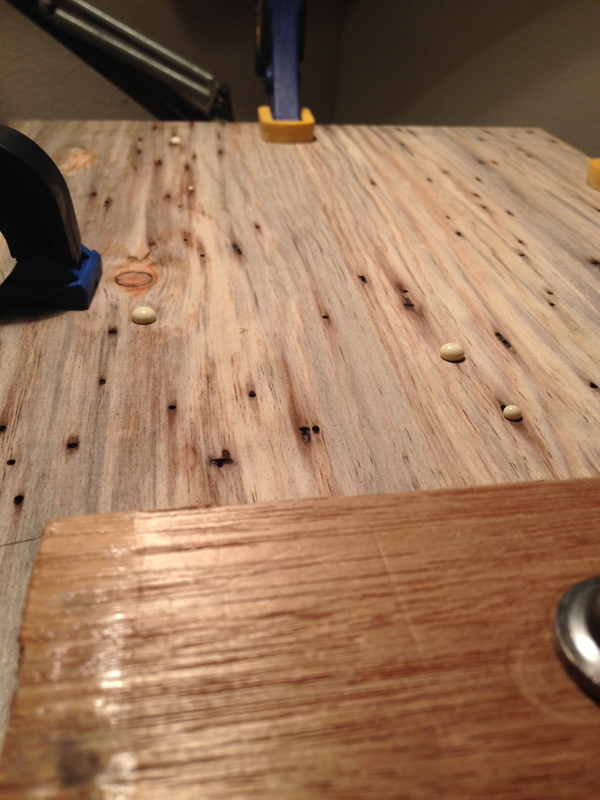 So I inlayed some new little pieces of spruce and put a brass plate-mate over the pin holes. 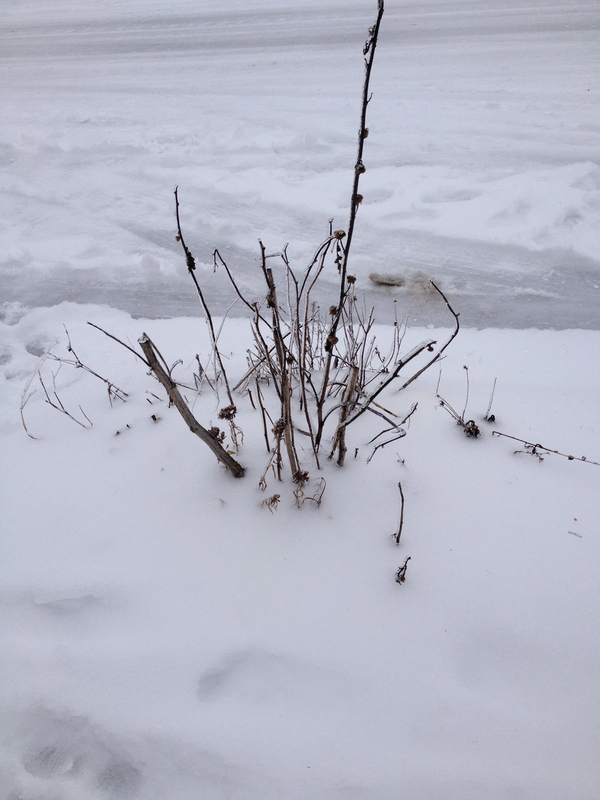 Then things stared to get tricky. 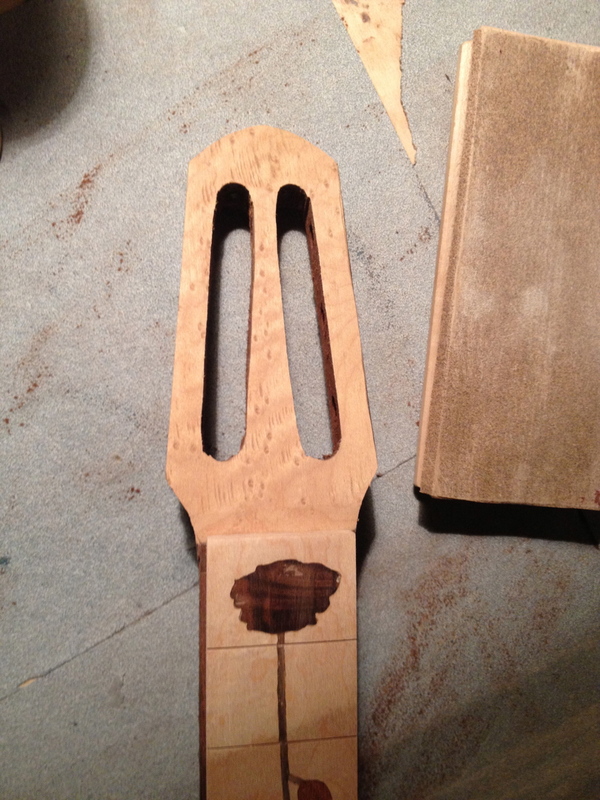 After I glued the back on it was time to reset the neck and re-fret the guitar. The fingerboards on these old Chicago guitars are often made of some ebonized wood that turns out to be exceptionally brittle. I removed the 13th fret to make a small hole for the neck steaming needle and saw the real job ahead of me was going to be taking out the fret without totally destroying the fretboard. I steamed the neck off and did my second ever re-set. While the angle was vastly improved and the the new joint stable, this didn't prove to be my most aesthetically prefect repair with a few little cracks and gaps, but i didn't want to anguish too much over what was never a fine instrument. Recently I started taking guitar lessons from Julie in exchange for some repair work i did for them last summer. Last week after my lesson Tarik showed me this Oud that was in pretty rough shape and said, "Here, learn how to make an Oud." as he handed it over to me. This Oud is VERY dry and I think it probably sat in a window somewhere for years and years as the top has shrunk quite a bit, pulling most of the top braces from the sides and cracking the top. This also caused some of the marquetry binding to crack a chunk of it is now missing..
A few of the slats on the back have come apart as well causing some of the mosaic inlay to fall out. This is the most ambitious repair job I've ever done for any instrument and i'm really excited to get started. Just a few months ago, at the central library here in Portland i had them pull Robert Lundberg's book "Historical Lute Construction" from the closed stacks just to because it sounded interesting. It turned out to be very interesting indeed one of my favorite things in the book were some pictures of the "Guadalupe Vihuela" which is one of only four period vihuelas in existence. Here is a little gallery of pictures of the "Guadalupe Vihuela" to click through. Now that I have this Oud I think its time to go back to the library and look at Lundberg's book a little more carefully. That way I can figure out how best to attack this project. 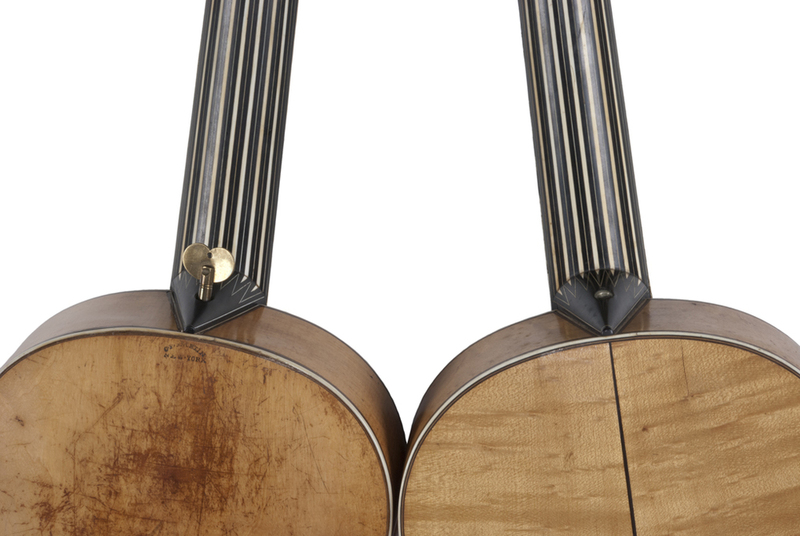 One interesting thing I learned about Ouds is that the top is left unfinished, just like guitars made in Mirecourt in the early 19th century. This, I'm sure, contributes the the tops susceptibility to humidity changes. I think the first step I'm going to take in this restoration is to attempt to re-hydrate the wood a bit and see if I can get the cracks to come back together without taking the entire top off. Stay tuned, and we'll see what happenes. 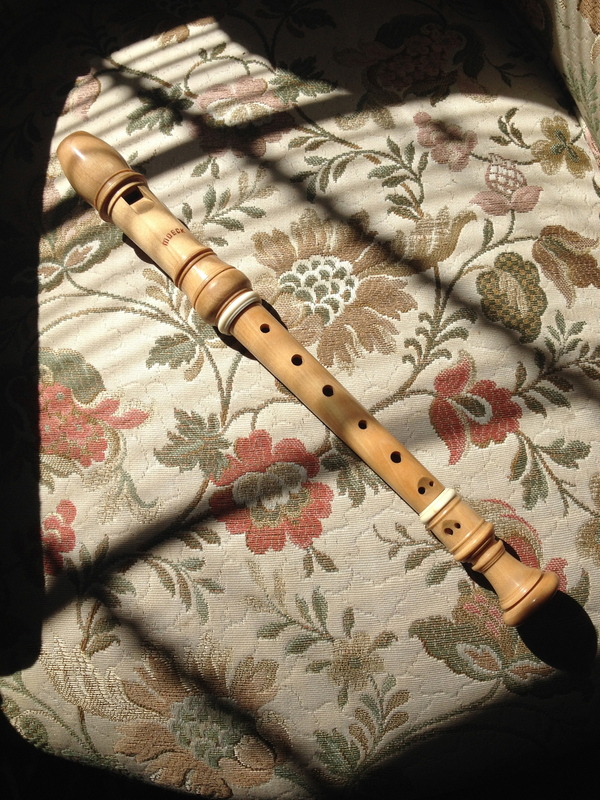 I used to play the tenor recorder in a recorder ensemble. I think I was around 11 or 12 years old, so that's my excuse, but really it's nothing to be ashamed of, at least not completely. It should be made clear that I wasn't scanning bulletin boards at music stores and rec. centers looking to join a recorder ensemble. I learned about the ensemble in my "general music" class, or rather it was offered to me an alternative to the general music class. It was never clear why the 6 or so other students and I had been selected for this group. I was really struggling with my ADD (among other things) at that time and I'm sure the selection couldn't have been based on merit. They were the classic black and white plastic ones, but it was the first time I had seen and played a whole family of instruments and it was very exciting. It was also the first time I had played real music with other people, where everyone has a different part. We were playing the recorder repertoire which it pretty old and limited as are the instruments, but our teach was Mr. Clark and he was a wonderful strange and sweet old man. He had terrible tinnitus so I think he like being around the noise of kids learning music so as to drown out the constant ringing. I remember Mr. Clark was the one who had come to our elementary school years before and shown us all the instruments that one can play in middle school band. It was magical to me that he could play all of them. He would say how terrible he was with each on and then play something completely beautiful on each one. Later in recorder class, he would show us all kinds of instruments and even brought in his engraved silver trombone. As a boy he had sold a bull calf that he had raised in order to buy it. He told us how disappointed he was when the calf was born a bull which mean he would be able to get as much for it and had to settle for the silver trombone in stead of the gold one. I really took to recorder in a way that I hadn't with music before. So much that I started taking more lessons from my aunt Mary. She is a classical Flutist, she taught me some Baroque and folky recorder music and would later encourage me to write my own pieces. Then I started buying CDs and getting into more age appropriate music, and after giving up guitar once around the age of 10, I picked it up again while I was working summers at OMSI claymation camp. The lead teacher and my mentor Mike Mckinney always made sure there were all kinds of instruments around and my love for music really bloomed. I got all sorts of instruments from Mike and started building some to take to camp too. I went in all kinds of directions with my interests concerning music over the years and and there's always more around and inside. Recently I've been falling back in love with big C Classical muisic. Mandolin virtuoso, MacArthur genius award recipient, repellant singer and head bobbler, Chris Thile took his new bajillion dollar mandolin and set about to learn some Bach. He really does a great job of it which adds to a great internal conflict I have about him. I just have to remember that Nickel Creek is not for me and thats ok. I've been watching a lot of these masterclasses. There are ones on youtube with Segovia as well. Julian Bream has a lot of personal charm despite his combover and goofy expressions. These are very nerdy videos, but I feel i'm getting a lot out of them as I'm stumbling along trying to learn some classical guitar myself. Celedonio Romero has become one my favorite guitarist. I wish there were more videos of him. But I found this mouth breathing kid doing my favorite piece of his, Fantasia. His video only has 75 views at the time of this posting so with any luck this exposure might bring him as many as 77. This kid plays circles around me but I've been trying to learn a few pieces myself. In that video I'm playing the my 07 cypress Ramirez that I bought in Madrid. But I've been building a classical guitar inspired by C.F. Martin's antebellum guitars. You can click through the gallery below to see the recent progress on that project. But the early martin guitar's always stood out to me. I really like the Viennesse style with the marquerty covered, clock key necks and the tight waisted friendly looking bodies. 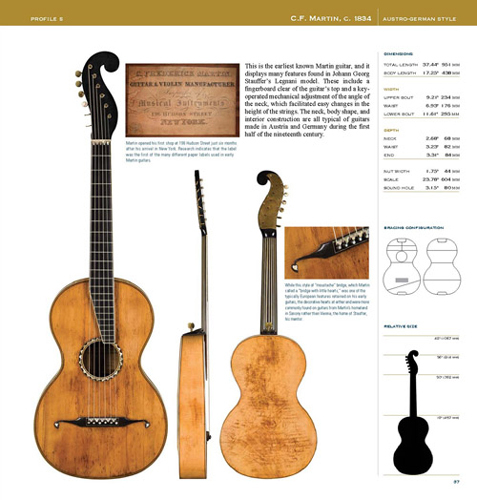 I would often visit Robert Corwin's great page on early martin called conveniently enough http://www.earlymartin.com/ and look in wonder and awe of the amazing old world craftsmanship. So I was all amped up and ready and was first to get it from the library, it made me wish they still stamped those little cards in the backs of library books. The book was very in depth and included great two page spreads of a ton of incredible guitars built by C.F. Martin and other great guitar makers of the period. I was really inspired by how different all of the guitars were from one another. Almost nothing seems standard, sizes, shapes, construction, decoration, Martin was a great experimenter. So I decided to make a little nylon string guitar inspired by some rough dimensions and some of the aesthetics that I found really exciting in these guitars. So the pieces are all coming together for this one. Stay tuned for more updates. We're coming out the other end of a big (for Portland) snow storm, that effectively hobbled the city and made for a strange 5 day weekend. I turned out to be a great time to reflect, make some art, and watch a pretty great BBC show called Mastercrafts. It's a sort of a competition reality show but in typical BBC fashion there is very little emphasis on who wins (after all nothing will truly restore the empire). The show takes three novices and teaches pretty rigorous traditional crafts. The moral ends up being, one can learn stonemasonry, greenwood carving, weaving, stained glass, and blacksmithing in a relatively short period of time, but no one can learn to thatch a roof. I had a little piece of walnut left from the first log my dad and I milled years ago. I made my first two instruments out of wood from that log. This little guitar is full scale 25.5 and has a carved top plate made of cedar and a large caved chamber in the walnut body. This last picture is a view of where the stairway leads.